In '88, it was the last round of the National League era with two Americans. Demons were up against Vincent's who were having a poor enough year. They were going through a transitional season. Basically, if Demons won, they won the league. Vincent's had nothing to play for but pride and being party poopers for Demons. They were playing up in Dublin. Neptune were playing Killester, had to win and hope Demons lost to win the league. There might have been a playoff if Killester won. They were another top team with Kelvin Troy and Kenny Perkins - whose son Kendrick played in the NBA [with Boston and Oklahoma]. It [Neptune vs Killester] went to extra-time and just as extra-time was just about to be played, word came - someone phoned the stadium - that Demons had been beaten. Vincent's had done the job up in Dublin. Whoever won this game, won the league. A Dublin team had yet to win the league in the two-American era. Neptune were going for the four-in-a-row. Suddenly, whoever wins this five minutes, wins the league. The whole season has come down to this five minutes. It was a crazy situation where it was a tied game with two seconds to go. A guy named Joe Healy fouled Kenny Perkins down near the Killester basket. Neptune were in the penalty. It was a stupid foul, they couldn't score from there - Joe would admit it. Kenny Perkins goes to the free throw line. Neptune call a timeout to psyche him out because it had worked before. He's there with the two free throws - nails the first one. The smart play with the second free throw would have been to hit the ball off the rim. He wanted to show that he could nail free throws. He swishes the free throw. One of Neptune's Americans, a mediocre player called Ray Lawton, inbounds the ball to Gerald Kennedy. He gets the ball just near the elbow of his own basket and hurls the ball towards the Killester basket. It's in the air and the whole stadium is watching - in silence. Kelvin Troy talks about watching the ball go over his head and thinking 'that's got a chance'. That is one of the most amazing sporting events - ever. - Kieran Shannon, author of 'Hanging From The Rafters', recalls his most memorable moment as a fan at Neptune Stadium. Before you can talk about Neptune Stadium, you've got to understand what was there beforehand - the Parochial Hall in Gurranabraher on Cork's northside. It's still there today and hosts the semi-finals of this year's Hula Hoops National Cup along with Neptune Stadium. Kieran Shannon calls the Parochial Hall the 'heartbeat' of Cork, and arguably, Irish basketball. Jackie Solan, sponsor of the Neptune club in its heyday, when it was known as 'Burgerland', acknowledges the Parochial Hall as being a 'cornerstone' in the architecture of Irish basketball. The facilities, however, were minimal. Basic, a benign description. In Hanging From The Rafters, Solan describes a fervent atmosphere but added that he 'never had a second piss in the place.' Let your own imagination elaborate as to why not. The seating may have been uncomfortable and the facilities lacking a certain polish but that did not deter supporters from jamming themselves into every inch available. Attendances at the time reportedly hit 2,500. The term 'hanging from the rafters' was a literal description of Irish basketball attendees in the 1980s, not a figurative one. Kieran Shannon remembers his first time attending the venue. He could not have chosen a better game - Demons vs Neptune, the hottest rivalry in Irish basketball. It was a revelation for a young sports fan. You went into the Parochial Hall and it was like that scene at the beginning of 'Great Balls Of Fire'. Jerry Lee Lewis basically goes into this shack that's off the beaten track. He's there with his cousin Jimmy Swaggart. It's just eye-opening. It's where he comes across black music for the first time. Tom Wilkinson would have been one of the leading Irish players of the era. He was my primary school teacher. You just went there for the first time - I wouldn't have known that Demons vs Neptune was that big a game - and the place was jammed. The first four black people I saw were on the court. They could all dunk, they were jumping out of the building. Neptune stadium opened its door on New Year's Day 1985. A monumental day for the club - and Irish basketball - was marked by an encounter fit for the occasion - an overtime game between the home side and St. Vincent's, the third best team in the country at the time. Shannon calls the stadium Ireland's finest sports facility when it opened. In the documentary 'We Got Game', an offshoot of Shannon's book, it's said that Neptune were the only basketball club in Europe, at the time, to own their arena. For all others, facilities were municipal, run by local government. A remarkable feat for a club located in one of the areas hardest hit during a bleak period for the Irish economy. Industrial employers across the city, such as Ford and Dunlop, were shutting down but there in a destitute landscape popped up this monument of modernity. Ireland's finest sporting venue they may have built but Neptune itself had humble beginnings. The club's origins were in the back yard of Michael Finn's parents' house. Finn would go on to be one of the key committee members involved in the construction of the stadium. It was a famous place called Finn's Yard which was basically his parents' back garden. It was like a scene in Witness [the 1985 Harrison Ford film] where the Amish community helped build the whole Neptune club. I don't know how far it went beyond a three-point line. If you were in Neptune, you just went into the back of Michael Finn's mother's house and you just put up shots. The stadium's conception was in the mid-70s when, on a trip to Belgium, club members began to think on a grand scale. They wanted Neptune to be a pillar of the community. A proper venue - their own home - would go a long way to ensuring that. Neptune were talking about having their own place like a GAA club has their own place. Basketball can be so transitory. A team could win the league and be gone in three years. They thought if they built a stadium - 'We'll be there forever'. The way you know that Glen Rovers are going to be there forever. There was always that vision and they were starting to work on it. Work on the stadium began around 1979, the location was east of the Parochial Hall on North Monastery Road. The site was provided by Cork City Council - a decision which might not have passed had they known the extent Neptune's resolve. It was an old site, old St. Catherine's square which was full of small derelict houses. It was rat-infested, basically. They contacted some people in City Hall and got the site. It was said to them afterwards that 'We'd never have given it to you if we thought you'd make it happen.' But they just were not going to be stopped. Bingo, a staple of Irish life, was one of the main fundraising avenues for Neptune. The biggest bingo nights in Cork were held at Neptune Stadium. When American players asked why they couldn't train, bingo was the answer. Neptune would win seven leagues in nine seasons between 1983 and 1991. The stadium, though a factor, was not the making of the club. Success would likely still have come. Its construction illustrated the scale of their ambition, it did not spawn it. 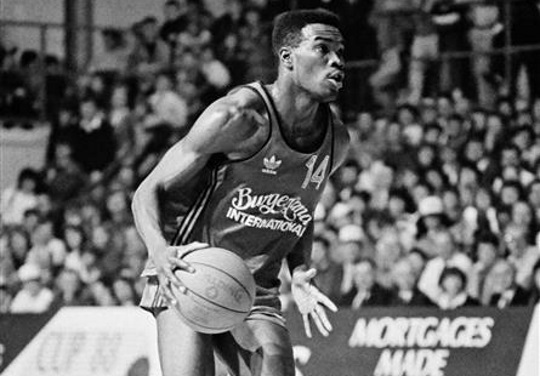 Basketball filled a void in 1980s Ireland which other sports had not yet recognised. In later years, Premier League football, professional rugby and a far better marketed GAA would overtake basketball. But, for around a decade, basketball games were the place to go. 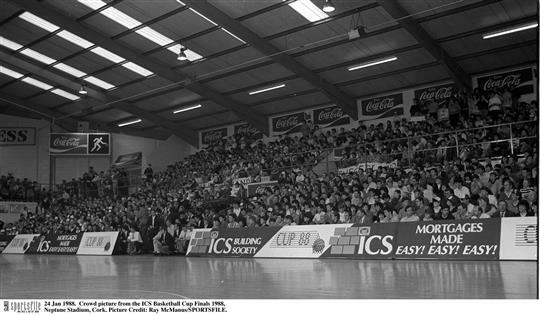 Timmy McCarthy, particularly well-known as RTÉ's enthusiastic Olympic basketball commentator and also one of the best Irish basketball players of the time, said in Hanging From The Rafters that Neptune Stadium was the first sports venue in Ireland where you actually wanted to bring a date. Kieran Shannon says basketball was an experience unlike any other offered by Irish sport at the time. There was no drudgery. It was fun - an escape from the realities of Irish life. Basketball was the first sport to treat sport as entertainment in this country. Otherwise it was just something to be endured. The National Anthem was played, there's the game and that's it. Basketball was the first where you'd have the chart music of the day being played. During the warmup you'd see the Americans dunking. You'd have the benchwarmers - the locals lads - doing their best moves, it might be the only court time they'd get. Neptune Stadium had that at a completely different level to the Parochial Hall. The tiered seating in the Parochial Hall was basically benches of wood. Now people go to a game and people get there as late as they can. Back then, you'd want to be there early to get the razmatazz of the warm-up and the introductions. Shannon recalls one particular St. Patrick's Day at the height of basketball's popularity. Nearly 4,000 packed into the stadium. Those hanging from the rafters probably had people hanging from them. Demons and Neptune were meeting and it was jointed. That rivalry really drove that era, it was like two tribes going to war. Reports that day were of an attendance of 3,850. I remember hearing a report in the car coming back, Mícheál Ó Muircheartaigh was on the radio bemoaning that there was only 3,000 at the Railway Cup. A decision in the late 80s to reduce the number of Americans allowed per team from two to one was a detrimental factor in basketball's decline in Ireland. It may have happened anyway but that decision accelerated it. 90 minute queues to attend games were a thing of the past. In later years, believing that they would not be able to fill the stadium to its capacity again, the decision was taken to install a gym behind one of the Neptune Stadium baskets at the expense of seating. Big games are still played on North Monastery Road but they will likely never see days like the 1980s zenith. 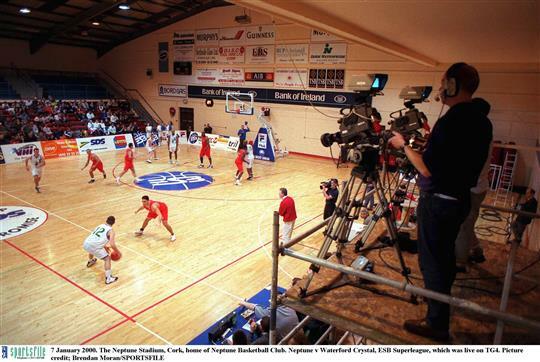 The Neptune vision - one which transformed Irish basketball - provided the oxygen for the scaling of those heights.